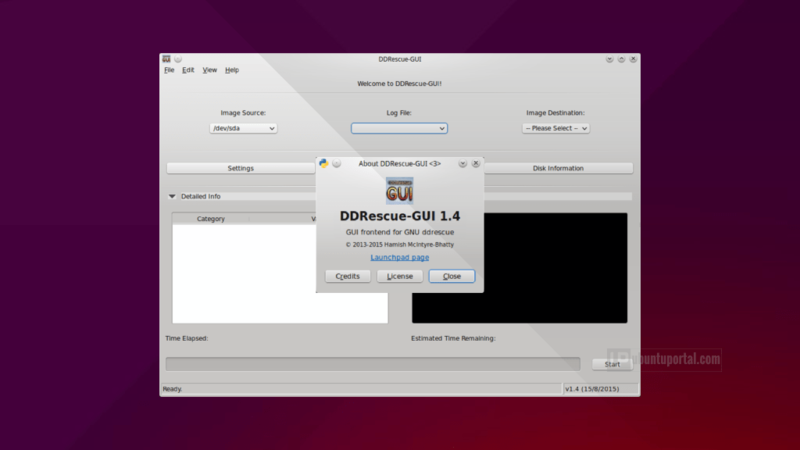 DDRescue-GUI is a simple GUI application written in Python 2 and designed to provide users with an easy-to-use GUI (Graphical User Interface) front-end for the awesome GNU ddrescue command-line tool which dedicated to recovering data from hard drive, USB flash drive, cd, dvd corrupt. ddrescue is an open source and free command-line software written by Antonio Diaz Diaz and designed to be used for data recovery tasks. It can copy data from one file or block device to another. In addition, ddrescue includes several algorithms and tools to not truncate output file if not asked trying to fill empty files. ddrescue has fully automated features that allow us to avoid blocking error, slowdown software etc., the process of saving files will be very fast and functional. Once installed, launch ddrescue-gui form unity dash, it required root password.